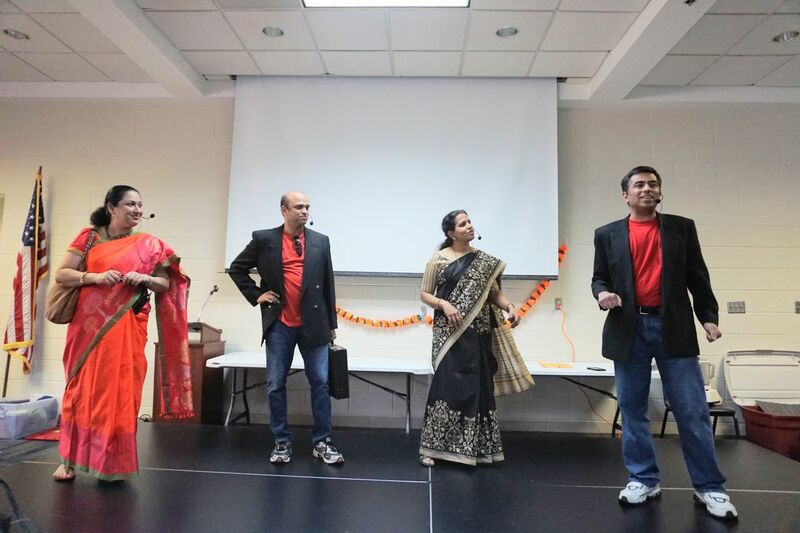 Atlanta, GA, May 7, 2018: The Konkani Association Of Georgia (KAOG) celebrated Yugadi on March 17 at the Roswell Center. Yugadi is an important festival celebrated in most parts of India with different names. As the word translates, ‘Yuga’ is era and ‘adi’ is the beginning, hence beginning of the New Year. It is based on the Hindu calendar and occurs mostly in March-April. This year, Ugadi was on the 18th, hence the celebration almost coincided with the actual date itself. Perhaps that was the reason for a record turnout, not seen on previous occasions. The space almost seemed confining at times for the audience! The festivities began with an invocation prayer by children, followed by the closing of unfinished business – a sequel to ‘Gondi Gaava Gelli Gamath or GGGG (appropriately with four characters with names starting with ‘P’), a hilarious skit from last year’s Diwali function. Like Part 1, the sequel was written by Murali Shenoy (who had to make do with seeing only a recording of his creation, as he was in India) and directed by Banur Nagesh Rao, in-house director and go-to person for skits. The highlight was a dance by actors Santosh Naikankatte and Deepak Shenoy that probably gave seasoned Bollywood stars a few sleepless hours! 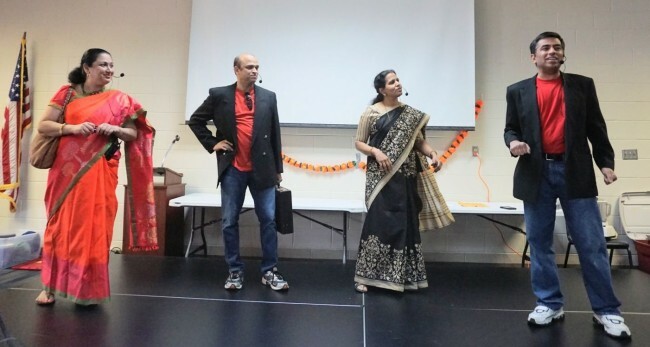 The next anchor show of the entertainment was ‘Amchigelish’, an extension of the widely popular show during the North American Sammelan in 2016. Filled with bilingual puns conjured by Ashok Bhat, the witty lines had the audience suitably entertained. It was then time to form lines of another sort, these snaking towards the lunch serving tables. Per the tradition since the beginning of KAOG, the lunch comprised traditional Konkani delicacies cooked by enthusiastic volunteers. The cuisine of the Konkan coast is among the most varied and diverse of all Indian cuisines, using a mind-boggling array of vegetables and leaves, both edible and used for flavoring. Much of it was on the menu, which has become an annual traditional treat that is anticipated by all members. The quantities more than matched the record turnout, a testimony to the planning and enthusiasm of volunteers. Post lunch was time for more entertainment – a children’s game of identifying things by their Konkani names, the brainchild of Pratibha Nayak, and conducted by Arvind Benny Benegal, who had to shush enthusiastic adults half the time from “helping” with the answers! 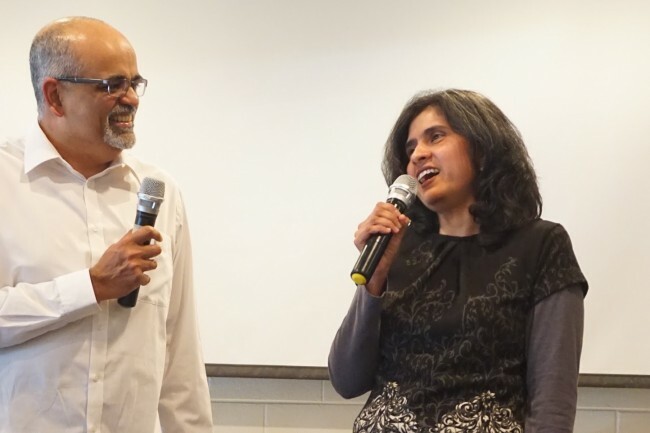 The last game of the afternoon thought out by Banur Nagesh was for couples who had to translate syrupy Bollywood love songs into Konkani and sing them to their spouses. It is during such momentous occasions that life-defining reputations are made, and this was no exception! The KAOG was formed in 2000, when a few families who have been meeting informally decided to form an association. Member events typically occur three times a year – Yugadi celebrations in March/April, a summer picnic in an outdoor setting, and Diwali celebrations in October/November. This year, as KAOG President Praful Shenoy announced, another event is planned in addition to the three. There are about 60 active families in the Atlanta metro area, and the few families strewn across Georgia enthusiastically make the trip for each of the events. 2018 kicked off great with a showing in record numbers, and with the participation of a large enthusiastic committee, the events promise to garner larger audiences.